Theresa performed with her band Good Company for over 10 years. Joshua Records: What’s in a Name? Joshua Records is named after Theresa’s son, Joshua James Demarest. The song “Bein’ Who You Are” from the album of the same name was written for Josh. He was in high school at the time. 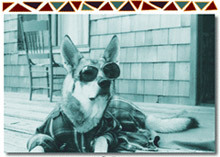 The Joshua Record’s logo was created from the sunglasses-wearing Brother, Theresa’s dog. The logo was lovingly created from an actual photograph of her amiable and laid back wolf-husky found abandoned in the forest in Bend, Oregon. One morning while vacationing with friends on the coast, Brother, in his usual low key manner, was lounging on the porch in his flannel shirt and sunglasses when a friend snapped this photo. The rest is history. Adding sizzle and spice to Theresa’s stellar musical story-telling talent was her band, Good Company. Comprised of some of Portland’s finest and most gifted musicians, Good Company provided a world class auditory tapestry, upon which Theresa spins her magical tales. During Live Concert performances Theresa often steped off the stage to allow the stellar members of Good Company to take their turn in the spotlight and do whatever they feel like doing that night. Myrtle Brown along with Janice Scroggins and Linda Hornbuckle performed a most outstanding version of a James & Jean Cheatham piece called “Meet Me with Your Black Drawers On”. Janice Scroggins at a previous PCPA Concert with Theresa Demarest & Good Company performed and exquisite version of her original song titled: “She Arose”. Theresa’s first Video. Theresa Demarest is happily engaged in her life long career as songwriter/producer for Joshua Records in Portland Oregon. Her CDs are sold and distributed nationally. Her live shows and award-winning music garnered a great deal of regional press. Life is good. Then something happened that changed the direction of everything and led to the making of A Herd of Two. While on vacation in 2004 she decided to take some horseback riding lessons. That’s when she came nose to nose with a little 6 month old highly spirited Half-Arab Half-Saddlebred filly named Tehya Takoda. This film is the first in a series of their compelling journey to becoming a “HERD OF TWO”. With the release of this DVD Theresa debuts her first film using instrumental versions of her music in the sound track. A documentary about Keiko’s life and legacy, utilizing footage from multiple participants in Keiko’s recovery and release efforts, and incorporating music written by Theresa Demarest and Good Company. Keiko The Untold Story of the Star of Free Willy is the first film to center on the killer whale himself and his process of rehabilitation and release after over fifteen years in captivity. More than a nature documentary, Keiko The Untold Story is a character study that delves deep into the world of the beloved orca. The goal for this film is to encourage folks to take a second look the whole effort to release Keiko back to the wild. Theresa has struggled with cancer twice. While it does not define her, it has shaped a lot of the triumphs in her life and is interwoven in her music and movies. Her passion for life and determination to do what she loves is a testiment to how she took this devestating aspect of her life and turned it into something amazing. She shares it as inspiration to others. Her story will inspire you to live life to the fullest, and support you if you have or are struggling with cancer yourself.